Peter the Great began building his model city in 1703 after a tour of Western European capitals after the Russian defeat of Sweden. Since its conception, St. Petersburg has always been Russia’s European city and was built reflecting the neoclassical style of the most liberal elements in Europe at the time. A Baltic Sea city, it was also mightily influenced by the cultural winds that blow between Scandinavia, the northern shores of Germany and Poland and the Baltic republics. About 70 percent of the Americans who visit the city come off of cruise ships that have also called at Oslo, Helsinki, Copenhagen, Tallinn and other Baltic Seaports. People visit St. Petersburg for its enormous historic significance based on the dramatic events that happened there throughout its history. 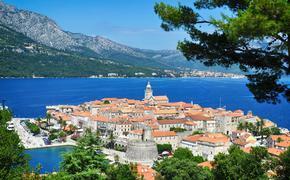 They also come for its incredible artistic, musical and literary heritage. The cruise visitors are generally confined to a half-day tour of the Hermitage and a whirlwind coach tour around the city. The city is also richly endowed with fine luxury hotels. Most of the signature events in Russian history took place in St. Petersburg. It was the Russian capital from 1712 until 1922 and as such the setting for much of the Russian Revolution; the intrigues of the Tsars and World War II. The cascading fountains and gilt statues at Peterhof Palace were inspired by Peter the Great’s visit to Versailles in 1697. Peterhof overlooks the Baltic Sea where Peter saw Russia’s future. Nevsky Prospekt is the main drag for tourists, the place where they shop for faux-Faberge Eggs, Matryoshka Dolls, Amber and painted lacquer boxes. The street is where the Church of the Savior on Spilled Blood stands with its lyrical onion domes covered in gold and enamel leap out. This is where an assassin’s bomb killed Tsar Alexander II, the man who abolished serfdom in Russia and supported Abraham Lincoln in our Civil War by contributing Russian ships to help defend union ports during the Civil War. Both Lincoln and Alexander terminated slavery in their countries and both were assassinated. Yusupov Palace, home of the 150-seat Yusupov Theater, attracts many cruise excursions for short presentations of ballet and opera. Among the luminaries to perform in the historic theater are Tchaikovsky and ballerina Anna Pavlova. But the palace is more famous for what happened there in 1916 when Prince Felix Yusupov murdered Grigori Rasputin, one of the most interesting characters in world history. The Cruiser Aurora, which fired the first and the last shot of the 1917 Russian Revolution, still sits on the city’s waterfront. The first Soviet government made its home in the Smolny Institute, a boarding school for girls founded by Catherine the Great. The building now houses the St. Petersburg government. It’s possible to visit the room that hosted the first post-revolutionary meetings in 1917, back in the days when the city went under its Soviet alias of Leningrad. The building also houses the humble living quarters of Vladimir Lenin. Even a casual walk through St. Petersburg’s Nevsky Cemetery tells how central the city is Russian art. Located at the end of Nevsky Prospekt, the cemetery houses the remains of Fyodor Dostoevsky, Nikolai Rimsky-Korsakov, Pyotr Tchaikovsky, and Igor Stravinsky. St. Petersburg was also home to Alexander Pushkin, Vladimir Nabokov, Joseph Brodsky and even, for a brief time, Leo Tolstoy and Vladimir Mayakovsky. For a city with such a rich tradition in art, it’s a little ironic that the art you see in its top cultural attraction, the Hermitage, isn’t even Russian. The list of masters whose works are represented in the Hermitage is too long to list. Suffice it to say that Michelangelo and Leonardo Da Vinci headline a catalogue that ranges from such masters as Raphael and Titian to Caravaggio and Rembrandt. The Russian Museum features most of the Russian art in St. Petersburg including a powerful collection of icons, folk arts, fine art painters and sculptures. 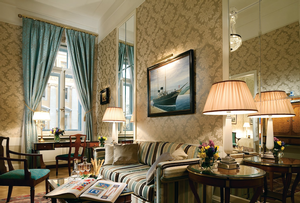 St. Petersburg has some of Europe’s best hotels. Tchaikovsky honeymooned in a suite in the city’s great heritage hotel, the Grand Hotel European (pictured above). Several suites at the hotel still include pianos for the musicians. On one night, Prokofiev is supposed to have played for Tchaikovsky in the hotel. Built in 1875, the hotel’s art nouveau atmosphere places it at the top of the city’s lodging pyramid. Forte runs the Hotel Astoria, a property so legendary that Adolph Hitler had planned to celebrate his conquest of Russia in. Fortunately, that party never happened. Many rooms look out over St Isaac's Square. Four Seasons opened its first Russian property last year in one of the city’s historic palaces. 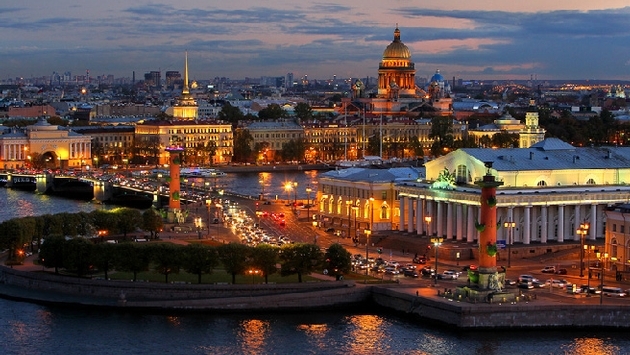 The Four Seasons Hotel Lion Palace is located next to St. Isaac's Cathedral and the Winter Palace. The hotel’s elaborate grand lobby leading to a variety of room options including the fifth floor Terrace Rooms, with panoramic city views or one of the first floor suites with towering high ceilings. The rooms on the southwest side look out on the golden cupola of St. Isaac's Cathedral. Where do you begin in a city with more than 100 museums (www.saint-petersburg.com/museums)? The Hermitage, of course, a museum so rich in art treasures and palatial grandeur that it has cast the rest of the city in its shadow. The Hermitage has more than 3 million art works in its collection from Impressionist masterpieces to Asian treasures. The State Russian Museum, unlike the Hermitage, focuses on Russian art. The collection, which was founded by the Tsars, expanded enormously when the art works were seized from the private collections of Russia’s pre-revolution plutocrats. Its 400,000 artworks attempt to convey the unbroken story of Russian art from 11th century icons to work by contemporary video artists. Though small the Russian Avant Garde Museum is recommended due to Russia’s pivotal role in the Avant Garde in the 1910s, 1920s and 1930s, this small museum is located in a charming wooden house on the Petrograd Side. The Peter and Paul Fortress is the first structure built in St. Petersburg and has served over time as a fort, a government center, the burial ground of the Russian Imperial family and a jail that held some of Russia's most prominent political prisoners. The Fortress is home to the Cathedral of St Peter and Paul. Crowned with a golden spire, the cathedral holds the graves of tsars from Peter I (1672-1725) through Alexander III (1845-1894). The Museum of Political History explores the politics of one of the world’s most interesting political countries. The attractive art nouveau mansion which houses the museum was built for Mathilda Kshesinskaya, the prima ballerina at the Mariinskiy before the Revolution, and Nicholas II's mistress before he became Emperor. In 1917, the building was seized by the Bolsheviks and turned into their headquarters. Lenin made a historic speech from one of the balconies. The Cabin of Peter the Great was the city’s first residence. The small wooden cabin, was home to Peter the Great between 1703 and 1708 and it’s filled with many of his personal effects.